Ham is the centerpiece of many holiday meals. 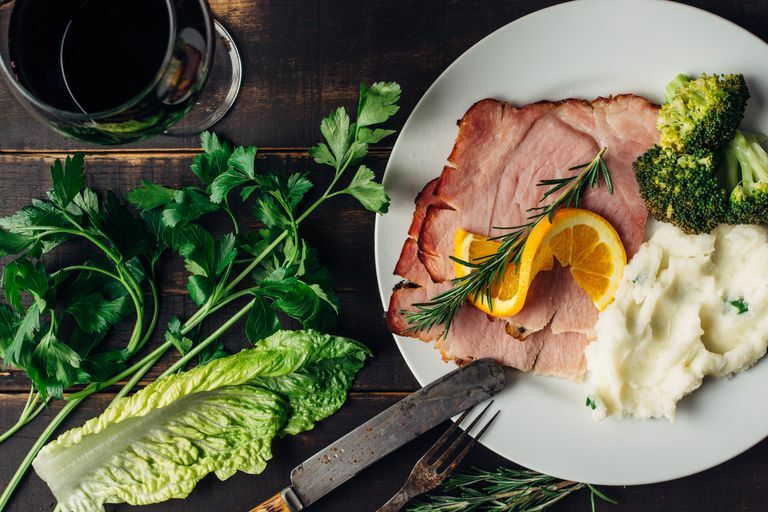 While it isn't a very high-calorie meal choice, there are some ham calorie and nutrition facts that dieters and healthy eaters may want to consider before sitting down for the holiday dinner—like the sodium level. And if you make a sandwich with ham, you should keep portion control in mind. While there aren't many calories in a slice of ham, some hungry eaters may layer too much of this mean on their sandwich. Calories in ham depend (as you might imagine) on your portion size. Portion size may depend on how you eat ham. A single serving of holiday ham is approximately 3 ounces or 84 grams. There are 130 calories in a bone-in, spiral sliced, honey glazed ham that you often see on the holiday table. You’ll also get 4 grams of fat per serving, 5 grams of carbohydrate and 1,230 milligrams of sodium. If you make a ham sandwich, you might choose ham slices from the deli. One slice of a typical ham luncheon meat from the deli (about two ounces) provides 37 calories, 5 grams of protein, 0 grams of carbohydrate, 1 gram of fat, and can provide up to 368 milligrams of sodium. Most people use more than a single slice of ham when they build a sandwich, be sure to multiply these numbers by the number of slices you use to get your total ham calories and nutrition. A single serving (one medium slice) of canned ham provides 55 calories, 7 grams of protein, 0 grams of carbohydrate, 3 gram of fat, and 517 milligrams of sodium. It also includes a significant helping of nitrates and nitrites, used to preserve the cured meat. While some people have concerns about these preservatives, there is not a lot of evidence that it's harmful. Ham is a good source of protein. It is also a very good source of selenium, phosphorus, zinc, vitamin B6, B12, thiamin, riboflavin, niacin, and choline. Depending on the variety and cooking method, ham can also be low in fat. So does that mean ham is healthy? It’s usually not the fat or calorie count of ham, that concerns healthy eaters. Ham contains a high amount of sodium. For people on the popular DASH diet, a single serving contains almost an entire day’s allowance of sodium. Even if you are not following a diet for hypertension, too much salt can make you gain water weight. If you want to cut back on sodium, look for low sodium lunch meats, including lower salt ham. What is gammon? Is gammon the same as ham? Gammon is the hind leg of the pig. Ham is also from the hind leg of the pig, but gammon is sold raw, has been cured, and must be cooked before eating. Ham is sold cooked and ready to eat. Gammon nutrition is similar to ham nutrition. There are about 123 calories in a single serving of gammon, 5 grams of fat, 18 grams of protein, 1 gram of carbohydrate and 1023 milligrams of sodium. What is prosciutto? Is it more healthy than ham? Prosciutto is Italian ham that is dry-cured. Most people who enjoy prosciutto eat it very thinly sliced so you are likely to consume fewer calories with this ham variation. One slice of prosciutto only provides 18 calories. When you are buying a ham for the holidays, figure that each person will eat one-half pound or less. Then buy with the bone-in for a more flavorful taste or boneless for convenience and easier slicing. Ham leftovers should be kept in the refrigerator. Usually, ham is good for 5-8 days. Ham can be frozen for up to four weeks. To make the healthiest ham meal, try to pair the meat with foods that are lower in salt. They will help to balance out the high sodium content of the ham. Side dishes like baked sweet potatoes, artichokes, carrots, green beans or asparagus work well. Having a ham sandwich? Choose a whole wheat bread that is lower in salt and high in fiber. Choosing another type of bread, such as a croissant, would provide less fiber and more calories from fat. To your healthier sandwich you can add crunchy low salt veggies to round out the meal. Sliced radishes or celery are perfect. You can also choose cucumber, cauliflower or cherry tomatoes.